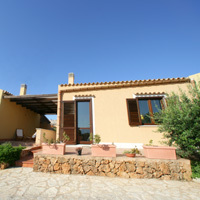 The "Alle falde di Cofano" Holiday Homes are fully-furnished villas located a short stroll from the sea (300 mt.) overlooking Mount Cofano, close to the palaeolithic caves of Scurati. The beach is distant 5 mins walk and Mount Cofano Nature Reserve just 10 mins walk. Each villa has a combined living and sleeping area, a fully equipped kitchen, bathroom, independent master bedroom and single bedroom, TV, washing machine, air conditioning, barbecue, private parking area. Outside you will find a barbecue, private parking area, a pergola with a garden table and chairs where you can sit and unwind. It is possible to accommodate up to 9 people. The property is ideal for groups of friends, large families, hiking -MTB - sea kayak lovers, beach holidays.